Deepika Padukone, Priyanka Chopra, Kangana Ranaut – who is the highest paid actress in Bollywood? Who is the highest paid actress in Bollywood - Deepika Padukone, Kangana Ranaut, Alia Bhatt, Anushka Sharma or Kareena Kapoor Khan? Over the past few years, the portrayal of women in Bollywood has undergone a series of changes. Not only have the women characters been given more importance, but the actresses are also being paid heftier pay checks. With the industry shifting its focus from superstar oriented films to better content, women centric films have been on the rise. With that, Bollywood actresses have not only got meatier roles, but they received a much better recognition. Their popularity has increased and with each actress giving hits after hits, they can now demand a larger amount of money for a film. In fact, some actresses even charge more than their male counterparts in several films! Ain’t that cool? So, we decided to compile a list of the highest paid actresses and find out who is the numero uno amongst the leading ladies. Talking about the pay cheque of the actresses, a trade source revealed to us exclusively, “The pay package depends from movie to movie, the kind of backing the movie has and the actress’ ability to rake in the money. Now a days, actresses charge more when the movie is based on or around them. It is a good scenario that a lot of films are being mounted with strong female characters, so now they can command an even bigger amount. However, it must be smartly budgeted or the burden on the actress will be more. That is the major hurdle, but I feel it can be sorted and it is a good time for the actresses, the trade as well as the audience.” The trade source further told us approximate figures that each actress charges per film, check out the list right here. After making her debut in 2007 with Om Shanti Om, Deepika has acted in 23 films. Most of the films have been hits, and with back to back box office winners like Piku, Bajirao Mastani and Padmaavat, DP now commands a fee of Rs 12 – 14 crore per film. Priyanka Chopra is a superstar, who has a global appeal. Not only has she ruled the hearts of Indians over the past decade and a half, but she has also achieved a lot across the globe, courtesy her TV series – Quantico. PeeCee was the queen of Bollywood after delivering back to back hits like Krrish 3, Gunday, Mary Kom, Dil Dhadakne Do and Bajirao Mastani. However, since then, she has been missing from action in Bollywood with her Hollywood career taking the forefront. But with her global popularity on the rise and with Indians eagerly awaiting to see PeeCee on the silver screen again, the actress still commands a fees of Rs 10 – 12 crore per film in India. Bebo is not only the finest actresses of Bollywood, but one of the most popular ones of the current lot. 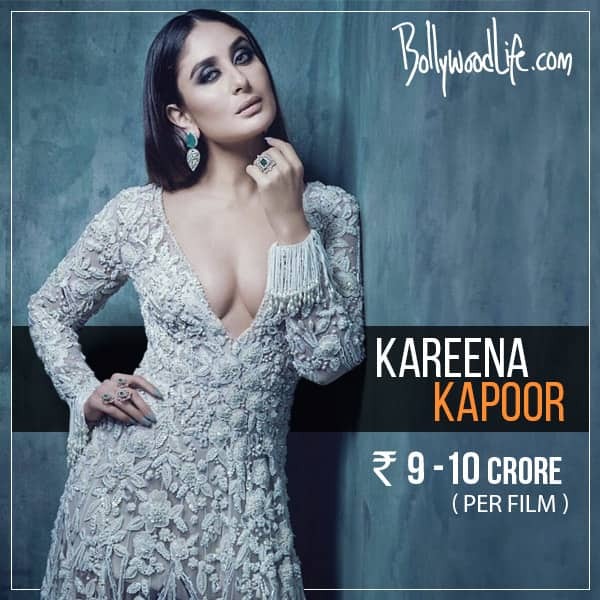 However, with the actress doing limited work over the past few years and her roles being limited in films like Bajrangi Bhaijaan and Udta Punjab, the actress is being able to charge only Rs 9 – 10 crore per film. Anushka is one of the most talented actresses of the gen next. Though she has given several hits, the actress has also seen a couple of flops recently like Matru Ki Bijlee Ka Mandola, Bombay Velvet and Jab Harry Met Sejal in her career spanning 16 films so far. However, with films like Sultan, Ae Dil Hai Mushkil and Pari showcasing her capability at the box office and her stellar acting s****s, Anushka earns nearly Rs 8 crore per film. Kat was the reigning queen of Bollywood till a few years ago. However, with back to back box office duds like Phantom, Fitoor, Baar Baar Dekho and Jagga Jasoos, Katrina’s market value took a huge blow. And even though Tiger Zinda Hai gave her the biggest hit of her career till date, it will take a few more hits before she can demand a pay cheque of more than Rs 7 crore. Shraddha Kapoor was the hit monster. Every unconventional film that she did, turned out to be a hit, be it Ek Villian, ABCD 2 or Baaghi. This enabled her to ask for a fatter pay cheque every single time. But with Rock On 2 and Haseena Parkar falling flat, the actress is currently charging only Rs 5 crore per film. Sonakshi Sinha delivered back to back hits with several superstars in her initial career. However, after taking up unconventional films like Noor, Force 2, Ittefaq and Welcome to New York, the actress’ standing at the box office has taken a hit with the films not working at the box office. And hence, she is charging only about Rs 5 crore per film. 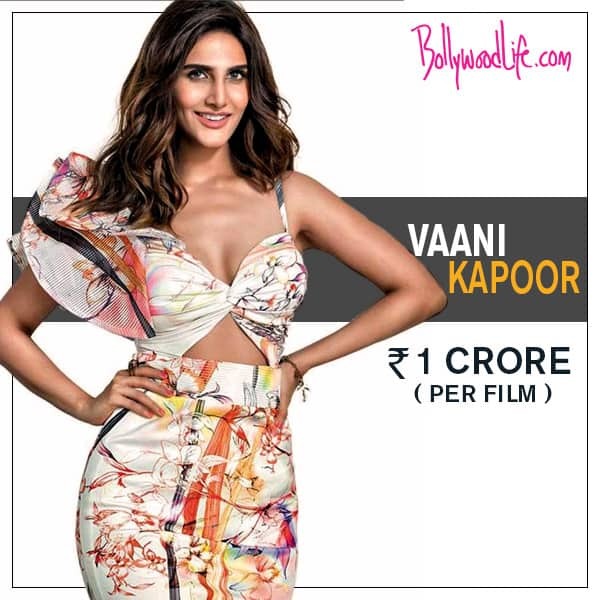 Vaani has been seen in just two films till now – one hit (Shuddh Desi Romance) and one flop (Befikre). However, with her raw talent combined with good looks, the actress is going to be a part of Hrithik and Tiger’s film with Yash Raj Films. Her popularity is also huge and hence, she easily gets Rs 1 crore per film. After looking at every actress and their pay packages carefully, we can quite clearly see that Deepika Padukone and Kangana Ranaut are the highest paid actresses in Bollywood right now. But who is your favourite actress of them all? Share with us your thoughts in the comments section below!